I AM A 5 STAR***** HOST AND I HAVE EXCELLENT REVIEWS!!! Just check my reviews on my profile. I'm very flexible with my guests and I'm willing to go out of my way to make sure they feel at home. The room is very spacious and nicely decorated. The bed is super comfortable. There is a really nice computer table for your business needs. The Wifi is super fast! 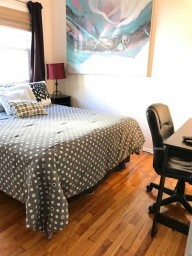 The room is equipped with a mini refrigerator, central air conditioner and heat, closet with hangers, TV with cable and Roku streaming stick that you access many of your favorites apps including Netflix, Hulu, Youtube, Sling TV and many more. Everyone that comes absolutely love the room! Especially how comfortable the bed is. I'm sure you will have a great time! Guests will also have access to the bathroom, kitchen and dining room. Fully equipped kitchen - feel free to use it to cook or do anything you need. I also have a washer and dryer at the basement which is free to use! You can use the dining room to eat your meals. Make yourself at home! Parking is off street but it is free to park and easy to find a spot. It is also very safe. I have a brand new car and have no issues parking on the street. The bus stop to NYC is just a couple of blocks away (walking distance). It's only 25-30 minute ride to NYC. You can check the schedule at the NJ Transit website. No Smoking of any kind please!